Too much fat can collect in the belly. 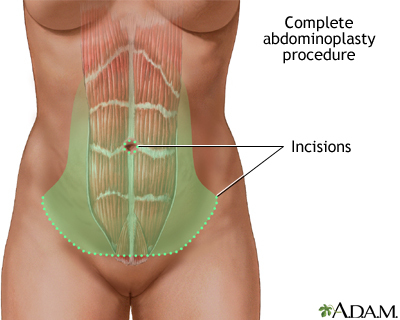 In abdominoplasty, some of the fat is removed. The surgeon will make a cut in the fold under the belly. This is the "bikini line." Skin is also cut around the belly button. 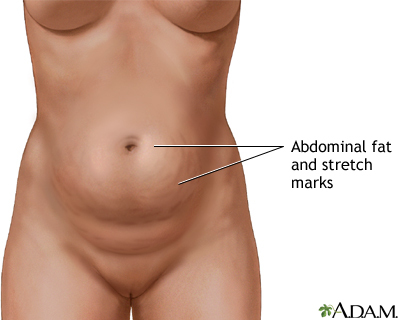 A large area of fat and skin are then pulled away from the muscle. 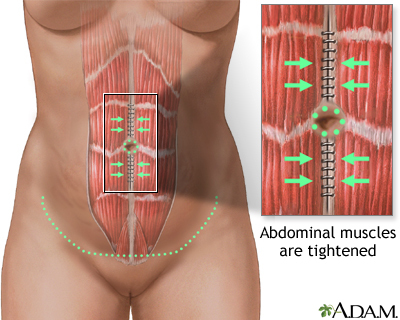 The surgeon tightens the abdominal muscles in the belly. The skin is then stretched downward. Extra skin and fat are trimmed away. A new hole will be cut for the belly button. The opening will then be closed with stitches. After surgery, there may be some pain and discomfort. This may last for several days. Resting with the legs and hips bent will put less stress on the belly. The remaining scar will fade with time.